"Obstetrics is all about building healthy families. Families come in all shapes and sizes and no two are exactly alike. My privilege is to help our patients and their loved ones navigate the excitement and obstacles that pregnancy can present." Dr. Garrett Fitzgerald joined the Department of Obstetrics and Gynecology at Medical College Wisconsin in August, 2017. Dr. Fitzgerald received his medical degree at the Stritch School of Medicine – Loyola University Chicago in 2010. He then completed residency in Obstetrics and Gynecology at Loyola University Medical Center between 2010 and 2014. He then completed a fellowship in Maternal-Fetal Medicine at the University of Maryland Medical Center in Baltimore, Maryland. 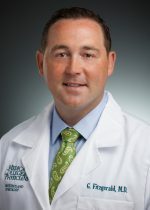 Dr. Fitzgerald’s areas of expertise include obstetric critical care, complex surgical issues of pregnancy, prenatal diagnosis, and abnormal labor patterns. He also has an interest in Quality Improvement and Patient Safety, particularly as it impacts patients of decreased socioeconomic backgrounds. Dr. Fitzgerald believes strongly in the team approach to quality obstetric care. This includes nurses, ultrasonographers, genetic counselors, social workers, doctors but most importantly the pregnant patient and her family. To this end, he was awarded the “Physician Partner” award by the nursing staff at the University of Maryland Medical Center during fellowship. His research interests include induction of labor, labor physiology, and surgical obstetric issues. Outside of work, he can mostly be found spending time with a growing family. New to Milwaukee he has enjoyed exploring all the great features Wisconsin offers to its residents for entertainment, outdoor adventure, and sporting events.